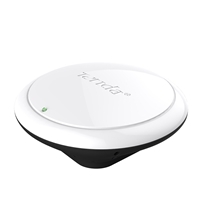 The Tenda i6 is an 802.11n compliant Wireless N300 Ceiling-mount PoE Access Point. It is designed to establish or expand a high speed wireless N network to connect multiple WiFi-enabled devices such as game consoles, Digital Media Adapters, Printers, or Network Attached Storage devices to an existing wireless network. Integrated with PoE technology, it delivers both data and electrical power over a single Ethernet cable, providing a compact solution that fits nicely into a situation where electrical outlet is unavailable or hard to reach for specific areas It delivers incredibly high wireless performance-8x the speed and 6x the range of wireless G, guaranteeing multiple users more freedom to enjoy a great wireless Internet experience in the home, office, cafe or even a hotel or airport. W301A is an ideal choice for hotel, enterprise, school to extend wireless coverage with exquisite design, wireless transmission distance, and fast speed.